The Siegfried family reveals the secret to the sweetest and fluffiest staple on their Shabbos table. My neighbors, the Siegfried family, like everything sweet. Mrs. Siegfried makes sure you can always find fresh cake, cookies, nosh, and sweet candies on the counter and chocolate chip cookie dough in the fridge (you know, in case of emergency). When she started baking challah she figured that since her family loves sweet rolls, she would make her challah the same way. They’ve been hooked since then. On Rosh Hashanah we try to eat sweet things for a sweet new year. This challah is the perfect way to start your meal. Prepare the crumb topping: Combine flour, sugar, and margarine. Mix to form coarse crumbs. Set aside. Begin by using 4 cups of warm water. Combine water, yeast, and sugar in the bowl of an electric mixer. Stir and let sit 6-7 minutes. Add eggs and oil. Add ⅓ of the flour, mix for a few seconds, until combined. Add another ⅓ flour, and mix just until combined, then the last ⅓ of the flour. Add remaining water (or just as much as needed for a nice sticky dough). Mix for 10 minutes on high speed. Remove dough from mixer and place in a large mixing bowl. Smear the top of the dough with a little oil. Cover and let rise 2 hours. Right before you are ready to braid the challah, preheat oven to 200ºF. When it reaches that temperature, shut the oven off. Remove risen dough from oven. Preheat oven to 350ºF. Brush challah with beaten egg and place crumbs on top. Bake in oven 45-50 minutes, tops should be golden and bottom should sound hollow when you tap it. (See notes.) . 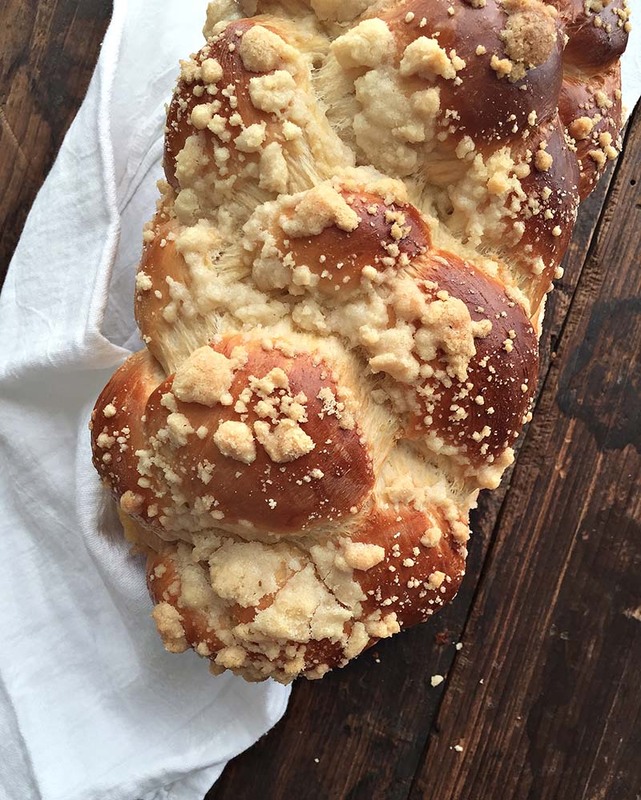 Challah has 7 ingredients, representing Shabbos, the 7th day of the week. Want to know how to braid round challah? Watch this video. Recipe created by Leah Schapira of Between Carpools. This recipe was developed using a Bosch (silver bowl) mixer that fits 5lbs of flour. You can halve the recipe to fit in a standard stand mixer. If your oven can not fit all 6 loaves at one time, only braid and proof 3 loaves first, then braid and proof (on counter) remaining loaves while the first set is baking.